Advanced manufacturing and machine tool: an overview. 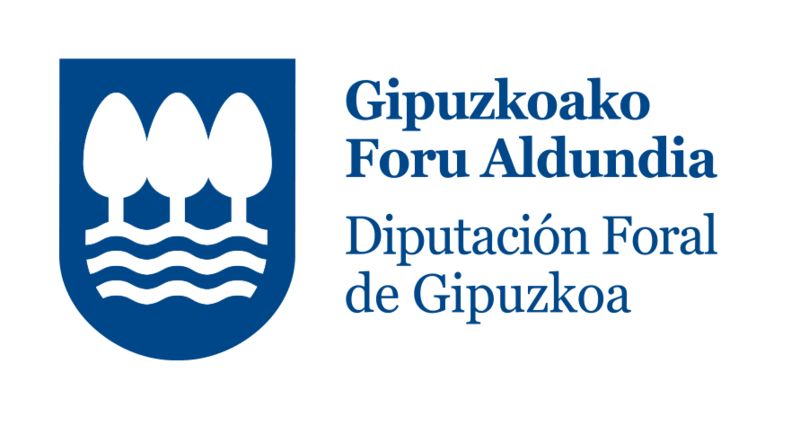 From 23 to 25 October 2019 the XXII edition of the Congress of Advanced Manufacturing and Machine Tools will take place in the Scientific and Technological Park of Gipuzkoa, in San Sebastian. It will be an excellent opportunity for those companies that wish to promote their products and services before a specialized audience, as well as to find possibilities for collaboration and networking. Advanced Manufacturing and Machine-tool: a global vision. The congress seeks to discuss the topics of greatest interest and relevance in the field of advanced and digital manufacturing, through conferences, presentations by start-ups, debates and other formats. The future of manufacturing in the field of transport: aeronautics, electric vehicles, etc. In addition, the Congress will have an exhibition area, where companies will present their most innovative products and services. Who does the 22nd CMH target? • Scientists, researchers, teachers and students related to the world of machining and advanced manufacturing technologies. • Professionals from the industrial sector who want to discover new aspects regarding machining and advanced manufacturing technologies from the viewpoint of industrial business management. • Human Resources Managers and Directors who want to discuss one of the major challenges that industrial companies have to deal with today: harnessing and developing specialised talent. • Young professionals, who want to inform about their start-ups and networking opportunities. The 22nd CMH provides an excellent opportunity for companies wishing to promote their products and services at a reference meeting in the advanced manufacturing sector. The meeting targets different profiles, such as scientists and teachers, Human Resources managers and directors, and senior and junior professionals. 1. BEING PRESENT AT AN EVENT WHERE ALL THE MARKET AGENTS MEET. 2. BECOMING A REFERENCE ORGANISATION FOR THOSE ATTENDING THE CONGRESS. 3. CARRYING OUT DEMONSTRATIONS OF DEVELOPMENTS AND APPLICATIONS. 22 km away. Take the AP-8/GI-20 towards San Sebastian and take exit 5 from GI-20. 101 km away. Take the E-70/A-8/N-633 and take exit 9B towards GI-20 Donostia/San Sebastian/Miramon. 50 km away. Take the A-63/E-5/E-70 and then AP-8/GI-20, and take exit 5 from GI-20. 469 km away. Take the N-1 towards Burgos and Irun until exist “San Sebastian Centre-Amara”. From anywhere in Spain, by means of the Spanish railway network, with station in the city centre. From anywhere in Europe, through France, by means of the French TGV network, arriving at Hendaye. 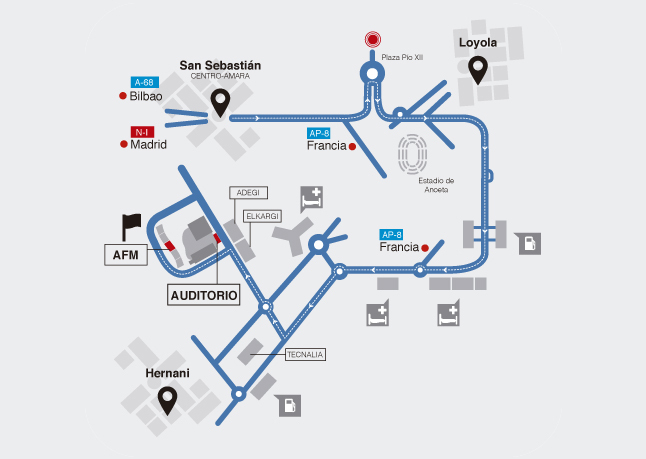 (entering by exit “Centro-Amara” arrival in 10 minutes) take Avenida de Madrid until you reach the Anoeta stadium. There, take the road that takes you up to Hospitales. After passing Hospitales at the second roundabout and on the right-hand side you will find the sign indicating the Technology Park of San Sebastian, where AFM is located. AFM Cluster is the organization that represents the interests of Advanced and Digital Manufacturing in Spain. From its headquarters in San Sebastian and its presence in China (Tianjin) it works to promote internationalization and, through its technological unit INVEMA (Foundation of Machine Tool Research), the technological innovation of its associated companies. At the same time, it brings together more than 60 partners, companies or organizations that carry out supplementary activities for the sector.